JR: Andy, I see that you have become a connoisseur of traffic. AB: In a way. There were times of the day and stretches of road which simply yielded better subjects. JR: Do you believe that the speed at which most of the photographs were made, the speed at which the subjects were traveling, contributes to how we feel about their degree of self-possession? JR: You made pictures of a manor house in Ireland before this project and it became your book, Bonnettstown: A House in Ireland. Although the photographs were interiors, they were really portraits of the people living there. You showed the inhabitants by not showing them. How does that work relate to these photographs of drivers? AB: I started making the car pictures in 1988 right before Bonnettstown came out. I wanted to try something larger, like showing the residents of a city through their interiors. JR: How did you settle on cars and drivers? AB: That’s what Los Angeles is. Drivers seem to be in a private room on wheels. JR: Private rooms in a public space. AB: Yes, freeways are the corridors to these rooms, providing accessibility. 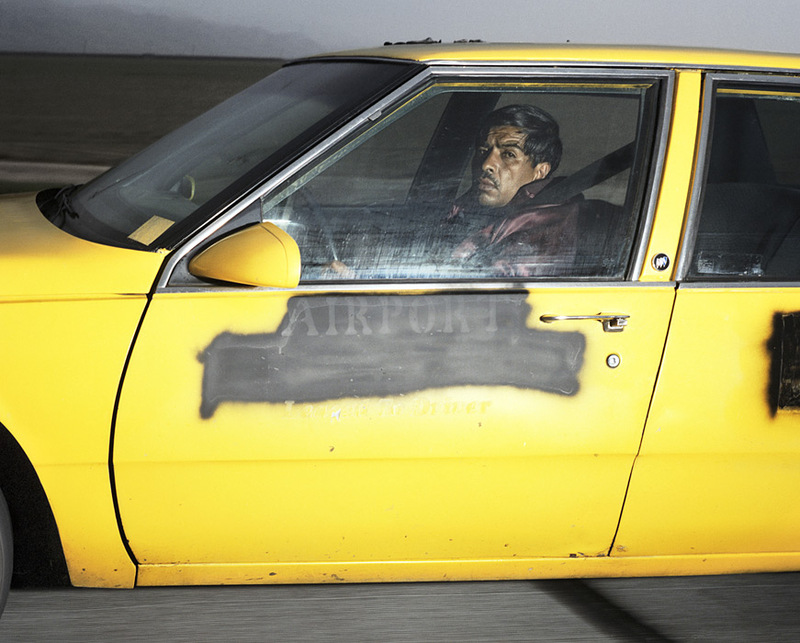 JR: How did you begin making your first Vector Portraits, your title for the photographs of people in cars? AB: I took out the front passenger seat of my car and mounted a medium format roll-film camera on a tripod weighed down with sandbags. Then I began driving through the city. JR: On those first journeys across Los Angeles, what did you feel you had accomplished with the camera? AB: I felt like I had tapped into a vein that would allow me to document something fundamental about the way we are seeing the world, and living in it. JR: What would that be? AB: A reverence for speed, image, class, invisibility…. JR: How could you tell what were the edges of the picture, the picture frame? AB: The frame, I imagined, was close to what I was seeing when I looked out the passenger side window. JR: Basically, you used your eye and the car window frame and that was roughly equivalent to what the camera was seeing? AB: Yes. All I really knew for sure was whether I was in front of or behind of my intended subject. Later I placed the camera on the passenger window ledge and used Polaroids to determine exactly what the camera was seeing before taking to the road. JR: And then you would drive? AB: Drive, look, and photograph. That was the beauty of it—it didn’t matter where I went. I drove everywhere until there was no light left in the day. JR: What determined your route? AB: Where is the sun, and where could I take a nice a drive without getting caught in bumper to bumper traffic—often times I would head out to Ventura to visit a friend’s bakery about an hour and a half away and come home with fresh bread. JR: What would make you decide to make a picture? AB: First, is it technically feasible—am I going the same speed as the subject, is my car lined up properly? And secondly, is the subject of interest? At one point, I tried to take a picture of every person I could along a particular stretch of freeway to eliminate my personal preferences. At another time I made photographs every 30 seconds whether there was a car next to me or not. This became more of a Buddhist way of thinking, or a scientific study—an attempt at pure documentation. In general, I drove around the city with my special camera set-up mounted in my car and would make pictures when an opportunity presented itself. You just never know exactly what you’ll encounter or what the camera is seeing, so it was better to make a photograph than not make one. As time went on I became more selective and sought to find subjects for a broader and more complete portrait of a driving society. JR: It seems that sometimes it was difficult for you to know when to stop. Did it seem that you could or should photograph everyone in Los Angeles? AB: Often I reevaluated my film and technical approach to come up with the most cost effective way to make as many pictures as possible while still maintaining, technically, an extremely high resolution image. JR: Why did you need such high resolution? Was it because the beauty in the details of the car finishes became much more apparent with higher quality films? AB: Yes. And I wanted to print them life-size. AB: Well large, about 30 x 40 inches which was relatively big for the time. JR: You had similar concerns with a number of other series that you were working on at the same time as the Vector Portraits. AB: I started the Vector Portraits wanting to photograph drivers as a way to look at a city and a way in which we live. But this soon spawned a number of other projects concerned with public/private space issues, like my Envelope Series. With the envelopes I believed I could catalogue subtle distinctions of public and private space based on what we intuit from the color, shape, and flap of an envelope. I felt that the height of the flap produced a shadow that could be read as either shutting us out or inviting us to look inside. JR: Like the windows in a car. JR: You presented the photographs of envelopes not in traditional mats and standard exhibitions frames but in old products from photographic history, something far more interesting. AB: The wooden and metal photo frames are constructed with various mechanisms—springs and clasps and dark slides—which seem to add another way to open things up, to inspect, so that we might read what’s inside. But they also seem to incorporate a degree of frustration. 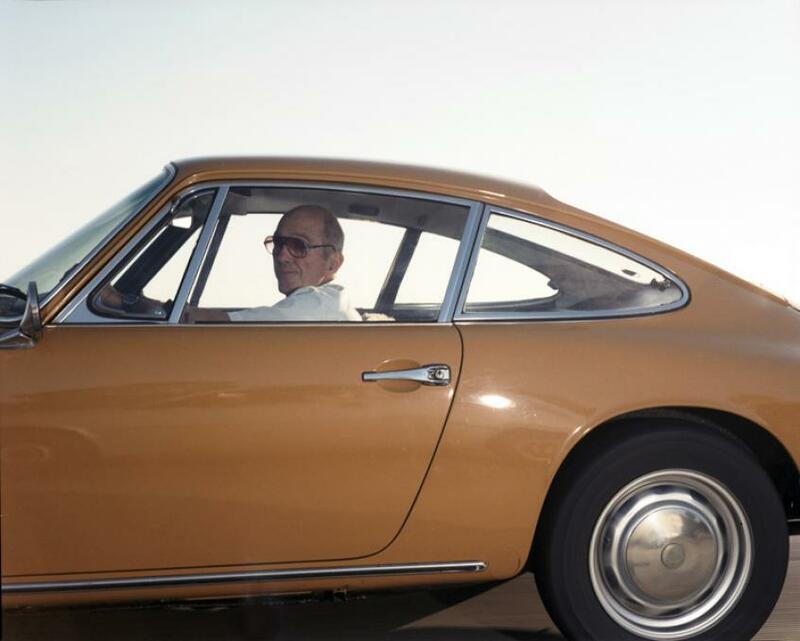 JR: The car pictures, like your photographs of envelopes, give the viewer something to inspect, literally to look into. We want to learn more about the subjects, to receive communication from them, but again we are left only with our projected speculations as to what the message is, or who the people in the cars might be. AB: The physical act of driving at such a high speed, and so close to another car, prevents us as drivers from spending too much time carefully observing—from seeing the car form in motion. I was determined to push the limits of the camera’s ability to record, to actually see what you couldn’t see with the naked eye, something that you couldn’t have witnessed in any other way. If you can anticipate that an object will pass before your eye then you can prepare yourself to pay attention. Whether or not you see something depends on whether you are concentrating or looking at the right place and time or have the means to do so. It could just as easily be a meteor shower. In essence, the process of making the photographs allowed me to carefully examine a space occupied by others that seemed, at first, inscrutable. JR: Despite the precision of your methods, there are a number of interesting ambiguities at play here. Is the car still or moving? Is the description essentially one of a public or a private space? You’ve embedded other ambiguities in the picture titles—in their precision/imprecision. AB: Right, the photographs describe a world that we can never really pin down. JR: It seems clear that in this work you were inspired by Walker Evans. To my eye, the obvious precedent for the Vector Portraits is Evans’s subway series from 1938-1941 published as Many Are Called. For these photographs Evans used a 35mm camera carefully hidden in the folds of his winter coat to record (without their knowledge) the faces, body language, and interactions of his fellow passengers. A few years later, in 1946, Evans completed for Fortune magazine a similar study of factory workers in Detroit. Evans stood with his camera on a single corner and photographed hundreds of pedestrians. Most were automobile workers. For his project and personal collection Evans also archived the classified sections of the local newspapers so that he would know the precise names of all the types of employees working in the city at the time: millwrights, watchmen, graters, patternmakers, joiners, plasters, glazers, platers, chasers, touch up men, spot welders. All these different jobs. Evans called the finished portfolio, “Labor Anonymous.” I think that what’s interesting about your project is that you not only record how our society functions, but you also pay close attention to how we, as viewers, without knowing what these people do, judge them solely based on their dress, their hair, their appearances. AB: Do you think the list of Detroit laborers sharpened his eye or just inspired his imagination and prodded him to continue making more photographs? Sure, it is easy to spot a butcher, or a man coming off work who makes plaster walls all day. But how can you tell an investment banker from a software developer? Today, a person can go through many different jobs. I don’t think people can be pigeonholed as easily by their appearances outside the workplace unless we are talking about general distinctions of labor—such as white collar and day laborers. I assume many of the drivers in my pictures are driving their own cars and traveling to or from work. There is some car pooling. There are also trucks that are obviously used for specific purposes: cement trucks and garbage trucks and plumbing trucks. There are trucks made for carrying big sheets of glass and improvised ice cream trucks with misspelled words. There big trucks with logos, taco trucks, and gardeners with their many rakes and trimmers and shovels attached. I would love just to catalogue gardeners’ trucks. To see how our society works through the shape of the vehicles that are used to move it and shape it would be a worthwhile project, and fascinating. If I saw a truck that caught my eye, that seemed unusual, and I was in a position to photograph it, I did. But that’s a different project. For one thing I would need a higher vehicle. More importantly, these photographs would not offer a view into the personal space of a driver in his or her own car which is essentially what I am interested in. These other pictures would be drivers in work vehicles along with the tools of their trade. Not a day goes by that I don’t see someone interesting driving by; there will always be other photographs I wish I had or could make. The work is never complete. And the manner by which people modify their cars is always changing. People seem to be detailing their cars more elaborately than they were ten years ago. I’ve noticed a lot of cars with decals of flames that run across their side doors. JR: Perhaps people have run out of space for body tattoos and are now beginning to tattoo their cars. When you made car pictures in different parts of the country could you see real differences in types of vehicles, clothing, and style of driving. AB: Absolutely. If this project were to be rounded out, one would have to travel to other states and parts of the country, to different countries with presumably unique designs, laws, roads, and ideas about public and private space. In Japan, for example, I understand that half the cars are either black or white. Cuba mainly has American cars running from the 1950s. In the Middle East the roads are filled with pick-up trucks and Mercedes sedans. And of course, China: the economy is moving ahead so fast that I imagine it is difficult for the population to keep up—to know how to drive or how to behave while driving. There must be a lot of new drivers on a lot of new roads that are probably not very well marked. I imagine one would find chaos and unpredictability and grid-lock. JR: I want to ask you about a related matter—that of the solitary driver. 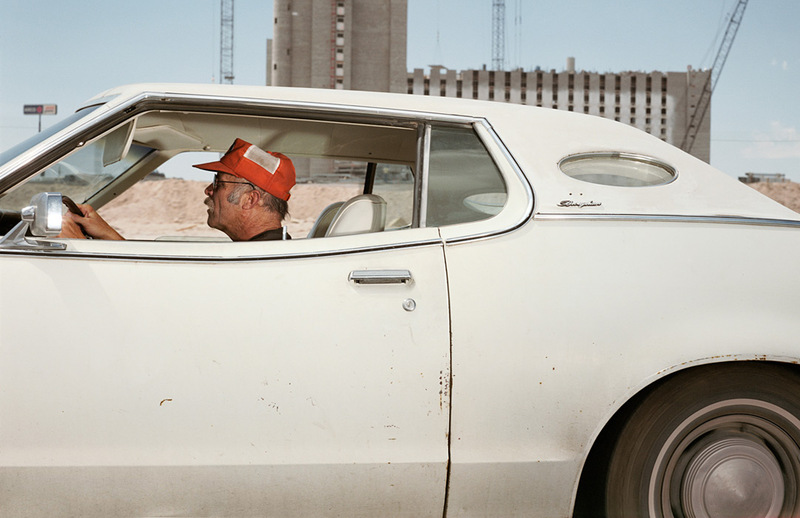 I must admit that I’m particularly drawn to the photographs of single drivers and I sort of lure myself into thinking that they’re the most successful. 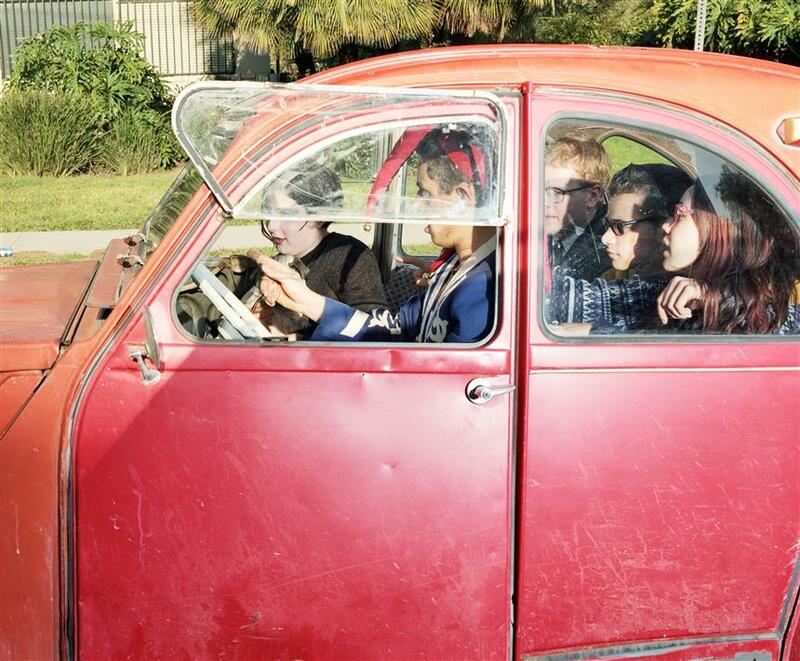 But there’s so many good pictures where there’s front seat and backseat activity, and multiple passengers. AB: I am always wondering, does that car belong to that driver? Or if I transplanted another person in that car would it seem like a perfect match of driver and car? It is easy to suppose the person driving is driving their own vehicle. 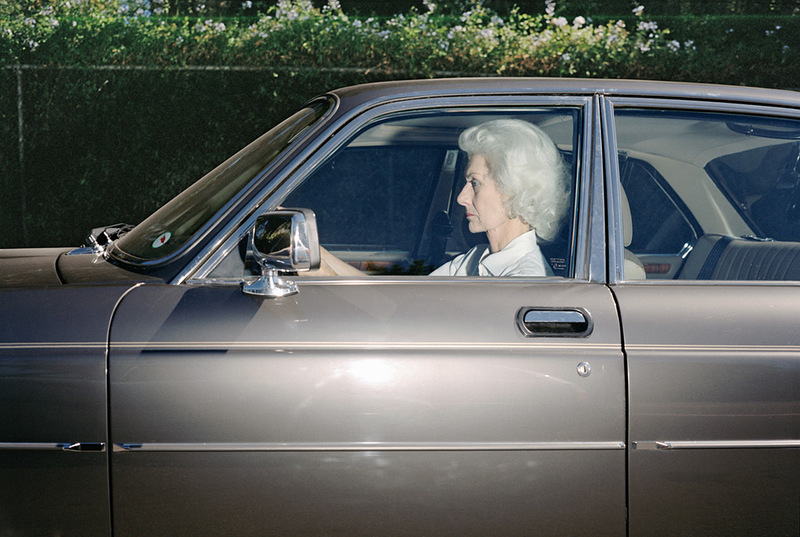 As viewers we want to find clues and we usually succeed in connecting the texture and age of the car to the appearance of the person driving. But then there’s also, as you say, the dramas suggested by trying to draw connections between the people in the car. Whether or not we are conscious of it, I think we impose stories on both the drivers and the people in the car based on our own life experiences and our need to make sense of the world. JR: Nonetheless, as in a novel, the viewer (reader) has to simultaneously interpret the author’s intentions—in this case the other drivers’ predilictions, desires, and fears. Do you think these photographs could be used for an ethnographic, or anthropological study? AB: Well, with the accumulation of enough images, maybe. With the ability to digitize and store the images with metadata, it would be easy to create searchable computer databases and look for patterns that couldn’t be seen with just a few photographs. This could be a useful tool for car design, but also for just looking at particular features, at a given time, within a given neighborhood. JR: So that at our desk one day we could see on a computer screen who is driving rusted red cars, with dents, in Boston? AB: Depending on what desk you are sitting at you might be able to do so now. JR: Since most drivers you photographed were unaware of the camera, do you think the pictures are more like candid snapshot portraits or do all the drivers present a public self dictated by the circumstances of driving? AB: I don’t think many drivers expect to have their photograph taken while driving—so there is always that element of surprise. But even if we were to consider these photographs as being made in a studio or in strictly controlled or rehearsed environment, a driver occasionally must pay attention to driving. And at these times candid moments can be gleaned. JR: Cars are fantastic works of art and perhaps the most ubiquitous type of modern sculpture. Yet society pays little or no attention to this aspect of our visual culture. Your photographs, I think, can be looked at in a lot of different ways but ultimately, for me, part of the intelligence of the pictures is simply in the collecting of great modern design. Let’s face it, the way people have used their cars has made them into very personal and unique works of kinetic sculpture. AB: Yes, imagine wearing the same clothes every day that not only stain but dent, too. JR: Can we talk about the titles? They seem to provide useful information about the photographs, yet they leave me thinking that what I am reading is data collected for an inexact science. AB: There is an attempt to make it a science while acknowledging that science works within the limits of its measurements. Just when you think you are about to pin something down, it eludes you. I wanted the cars and drivers to be considered as particles moving through space. That is why I titled the series Vector Portraits. The Heisenberg Uncertainty principle has been misapplied in so many ways, but it really is about physics. It says simply that we can never know the absolute position and magnitude of a particle at any given time. JR: As we drive through the world, we are never quite in it, never in any one place. Ever? AB: Or can we ever really know a person by our proximity to them? If you and another driver are side by side, eight feet apart, traveling the same speed for over ten seconds,an imagined intimacy develops. We are wed by speed and direction and relative closeness and eventually a cultural violation is sensed—as though that speed within the same parallel path should only be owned by one driver. JR: At one point didn’t you exhibit some prints from the series in the Los Angeles DMV, in the Department of Motor Vehicles? AB: In 1992 I became interested in creating an exhibition venue outside of the gallery system. I wanted to make the photographs available to the general public, or at least the driving public. I was especially interested in the DMV because it’s the place where people go to get their driving identity. I also wanted to play off of people’s paranoid suspicions of being under state surveillance. Back then it was still about Big Brother is watching, Big Brother has control of you. But now, since 9/11 we seem to want to be watched and listened to and to have our data mined by the government. Cameras now are everywhere and people seem to feel more secure knowing their environment is monitored. JR: How did you use the specific space the DMV offered you? Were the photographs actually installed in the room in which you apply to get a driver’s license? AB: Yes. The DMV in Hollywood is a very large room in which people stand in long lines close to the walls waiting to register their car or be photographed for their license. When I installed the photographs, I didn’t put my name by them. I just listed the titles. One day a woman came in to register her car and while standing in line saw that she was the subject of one of the photographs. And she made inquires to find out what these pictures were about. She worked for a lawyer and I soon received a letter forwarded by the DMV stating that the photograph and its title implied that she was breaking the law, that she was going 68 miles per hour (at the time the speed limit was 65—now it’s 70). She argued that she didn’t feel that she had been going 68 miles per hour at that particular instant. The whole thing was absurd: how can anyone remember what speed they’re traveling at any given moment in their life? Nonetheless, she claimed she looked down at her speedometer and remembers going under 65mph when she mistook my flash for the flashing light of a police car. JR: Andy, I know you remain interested in pushing the boundaries for where art might be experienced by the public. We’ve discussed the idea that there is public radio and public television and that there should be a kind of public outdoor art. AB: The commute that people endure everyday in Los Angeles seems to provide the perfect audience for something other than outdoor advertising and I feel that one thing that could be done is to create a series of art billboards along a mile or two of freeway. There might be twenty consecutive billboards, or billboard type structures, that a curator could use to organize exhibitions. They would function only to serve up art. The project would be administered by a rotating panel of curators and artists and perhaps funded by the Los Angeles Percent for Art Program. JR: I guess in theory this might create a vibrant environment that could expand the general public’s awareness of art. At the least, everyday hundreds of thousands of people would drive by. Maybe your car pictures should be the first to appear in this “Freeway Gallery” since you have created an art that is about the road, the language of travel, the language of movement. Driving is an especially cinematic experience. As drivers we experience the world as though we are watching a film. AB: Right, I am doing the filming while driving. JR: That reminds me of the great film by Dziga Vertov, Man with a Movie Camera (1929). Vertov films his own cameraman making the movie he is making and we are watching. 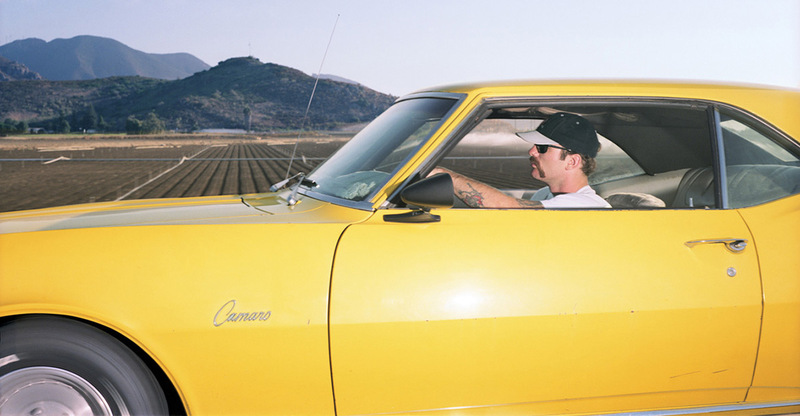 It’s all quite synesthetic, like your photograph of a man driving and simultaneously reading an LA street guide. Isn’t the index of Los Angeles streets [the Thomas Guide] more than three hundred pages of tiny print and maps that’s hard to read even if you’re sitting at your kitchen table? AB: Yes, that’s the Thomas Guide. Usually after a few months the pages you need are in tatters or are lost and you end up throwing the whole guide out and getting another. In general, printed maps are disappearing, being replaced by GPS navigation systems. Digital is wiping out analog and with it goes the tactile. Even now, if you don’t have GPS you might go to your home computer and check to see where there’s traffic. Then you’ll check Google maps and plot your course. That way when you leave you have a much better preconception of the city—almost a zoom image loop playing in the back of your head. JR: The idea that the driver is reading a book and not paying much attention to the road, at least in this moment, is important. I guess he’s trying to figure out where he’s going, or where he’s going to go next. But another aspect of the picture interests me as well: the simple beauty of the spinning hubcap. This alone is quite a ravishing piece of visual description and a great image of motion within stillness. I think it also provides one of the keys to the humor and the apparent contradiction of public/private space that is always a part of your work. We feel speed will give us the means to evade detection and scrutiny and then we are surprised to see that it doesn’t. AB: I feel photography can be used to examine public/private social space. The process of making a photograph can provoke and accentuate that juncture and make the divide more obvious. JR: I know you used an electronic flash. What did the flash do? Did it allow you to use a faster shutter speed? AB: If I was tracking my subject properly, I was in synch with their speed and I didn’t need a very fast shutter. What the flash did was open up the shadows of the car interiors. It also separated the car from the landscape. And it did this great thing to the metal surface, producing something like the reflection you see when the sun is hitting the side of a car. JR: You get this flash of metallic glare when you just walk or drive by a sun lit car. At times the car itself creates its own flash—at least on sunny days in LA. Anyway, I think the flash is very effective. Did it ever cause any problems? AB: On a bright sunny day, you can’t see a flash unless you are looking directly at it, and even then it is easy to mistake for sun reflecting off a shiny surface. I positioned the flash so it never caught the driver square in the face and I never took photographs at the moment a driver might turn to look at my car. If they looked over I would always give them time to register what was going on and then there might be a charade, and then maybe a picture, or maybe not. Occasionally a driver would mistake the flash for an approaching emergency vehicle and look in the rear view mirror. JR: So what is this Andrew Bush Project? Aren’t these all Andrew Bush Projects? AB: You know how awkward it feels when you meet someone with your same name? I wanted to explore that awkwardness. So I wrote people throughout the country who shared my same name asking if they would be interested in participating in a photography project which I explained to them as best I could. There were quite a few, about a hundred people named Andrew Bush, most of them living east of the Mississippi. More now of course; at least more who have computers who use the Internet and whose names show up. Not all wanted to participate. I drove across the country hoping to visit those who did. Some Andrew Bushs who initially agreed to cooperate threatened to call the cops as I got closer to their homes. I guess they were worried about identity theft, though I don’t think it happens that way. At first I simply wanted to photograph an interior from each house to create a composite house, but after meeting with a half a dozen Andrew Bushs I knew exactly what I needed to do. I needed to have the other Andrew Bushs photograph me within the contexts of their lives, on their stages, in their homes, driving their cars, eating dinner with the family, writing checks, whatever it might be as a way to create a photograph with a caption that would be both true and a false: “Andrew Bush’s Family at Dinner.” I would be seen eating with the other Andrew Bush’s family. “Photo by Andrew Bush.” Actually, the first two Andrew Bushs I visited were selling their houses—so, in theory, I could have just bought one, moved in, and confused the mailman, too. Anyway, it’s a work still in progress. JR: We’ve already discussed the flea market pictures and the envelopes. So how do your photographs of business cards relate to the car pictures? AB: All of these projects simply provided another way for me to consider public/private space issues and ideas about communication and identity through photography. I think the Business Card series is more finely edited than when I first showed it in 1996. At that time, I presented a broad selection of different types of people showing different countries, sizes, professions, expressions of identity. I’ve now sorted the cards into a number of different categories—two of which make more sense to me than others. One, is the business cards of celebrities. Some dead. Celebrity business cards or personal cards are something of a misnomer. Celebrities don’t need to network or give their information to others so their cards are somewhat impossible to come by. The other, is a set of business cards from psychics living in Florida. JR: Essentially, you fastidiously collect the cards and then enlarge them each 20 or so times, thereby transforming the cards from the private realm to the public one. AB: Yes, changing their dimensions transforms them into signs. And exhibiting them publicly gives us an opportunity to call the celebrities, to have a personal encounter with them, to invade their privacy. Since they are public figures, we already feel we know them and feel, incorrectly, that we have the right to talk to them, or leave a message. Except they are dead. Maybe the numbers are still valid? Some people may keep their telephone numbers active even after they die. I imagine websites that provide some sort of virtual encounter will be the future memorial grounds for the dead. Allen Ginsberg was the Walt Whitman of his day and though I haven’t called his number I would like to believe his voice might be on the other end, reading his poetry. JR: It seems that most all of your work deals directly or indirectly with failed communication. AB: Or at least with the yearning to communicate, or, for one reason or another, the impossibility of communicating. When that juncture between private and public space is bridged we are expressing ourselves to someone, and whether or not our intended message is understood we are still communicating, even if it is an intrusion. JR: In many ways I think the Vector Portraits work as a classification of styles, of design and speed. We could almost say that the speed at which a person is traveling is just another layer of clothing. How much do you believe drivers are aware of how they are presenting themselves to the public? AB: I think most people are aware of how they look on a very basic level. They have an idea of whether they are clean cut or slovenly, whether they stand out or blend into society, whether they are physically attractive or not. But there are also the circumstances of travel. Are the subjects returning from work, going out to dinner with friends, or just trying to get from A to B. How we consume, use, or integrate our culture into our lives helps to shape or frame our appearances. I believe most people have some idea of what these cultural products or signs mean in terms of defining their class or lifestyle. But I don’t think many people have any idea how they will appear when photographed if they haven’t already seen themselves or images of others in similar situations. 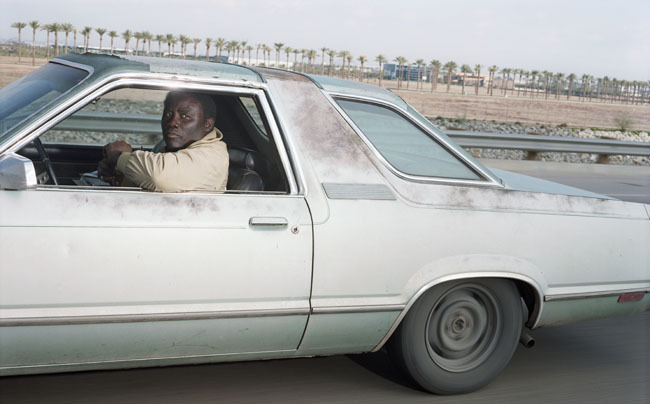 JR: I would imagine that the only cultural frame of reference another driver might have for a photographer sidling alongside their car may be the paparazzi. As you might remember, the photographers (on motorcycles) who pursued Princess Diana in Paris were initially going to be prosecuted as accomplices to her murder until it was discovered that her driver was intoxicated. AB: Well, I would like to talk about the work in relation to celebrities anyway. The public feels it has the right to look at celebrities, and celebrities feel they have the right to appear in public without having their privacy invaded. Both speak to the value we put on appearances as a way we define our public and private space. When I began this work I was thinking about celebrity portraits; the more a person circulates their image, the more they are seen, the more they take on the aura of the celebrity, of being everywhere, familiar, recognizable. By merely driving around in your car, you are to some extent circulating your image and becoming a celebrity of sorts. Today, the internet makes it possible for everyone to create their own multimedia self-presentation. Part of my intention in making these photographs, circulating them, and displaying them life size was to inflate the ordinary, to make everyone a celebrity under surveillance. JR: Well, that makes me wonder about the photograph from 1997 of the woman driving a Mercedes convertible while talking on a cell phone. In many ways this picture records the beginning of a cultural shift away from how our culture defines public/private space through appearances, away from the celebrity portrait, towards a culture we live in now. A culture in which interactive digital media is the envelope that defines our privacy. And of course our ability to manipulate that technology, to be connected establishes our presence. For the most part you seem to have avoided photographs where there is more than one vehicle. But here, with the woman on the cell phone, there is a progressive (or stepped) deep space. In most of your other photographs there seems to be only near and far. AB: Actually I was very indecisive about whether to include that photograph. Our discussion convinced me to take it out of the book proper. I had put it in the very center of the book to disrupt or stop the flow of the sequence, as a kind of “traffic jammer.” It has a completely different effect from the others and in the end I decided it was too disruptive. 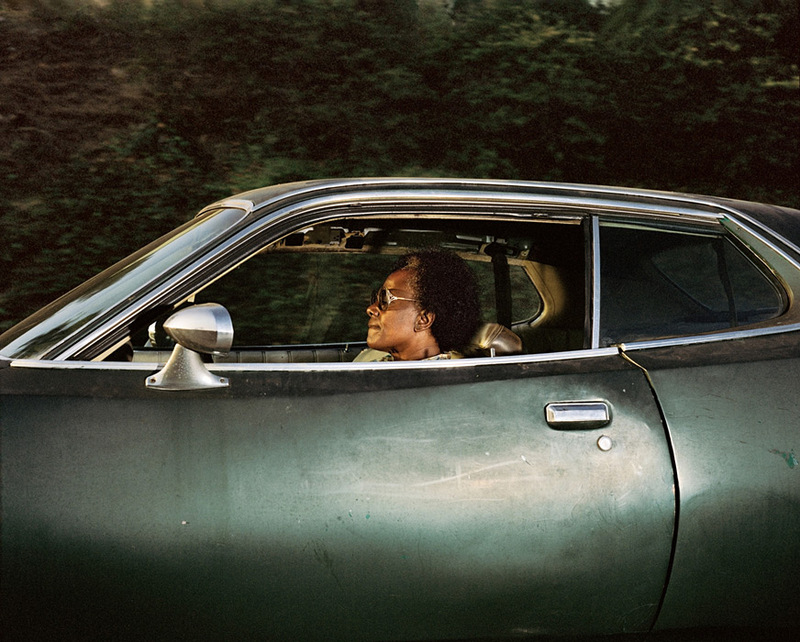 JR: The other photographs describe a solitary world of a person or a group in a single car with no other cars around. It is a world in which we are the only ones peering in. In this picture, there is no enclosed, interior space; the subject drives a convertible and is surrounded by other drivers. She is already exposed; there isn’t any privacy at least as it’s been defined in the other pictures and therefore the viewer doesn’t get the sense of being outside looking in. AB: Right. We can’t be voyeurs. If we could listen in to her conversation, we could at least eavesdrop. This photograph needs sound. Like you said, changing technology has dramatically altered our notions of privacy. When I began the project, perhaps ten percent of the population had mobile phones. Eight years later, probably sixty percent of the driving population had mobile phones. JR: What were you thinking about when you sequenced the pictures? 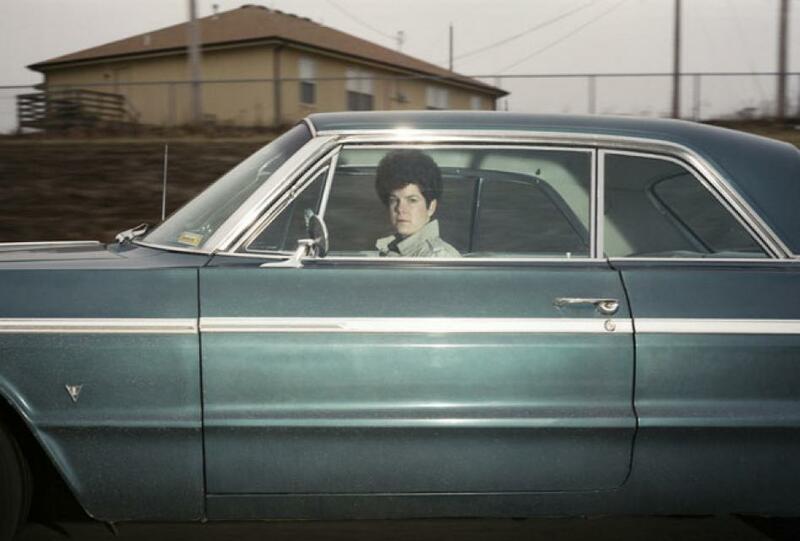 AB: I tried to select a suite of photographs that as a group would define a diverse coherency of drivers that might suggest encounters we all might have if we were driving along a freeway with maybe some intermittent exits onto side streets. JR: There are sixty photographs in the book. If every picture was a minute, you’ve created for the viewer an hour’s drive, a typical commute for many people. 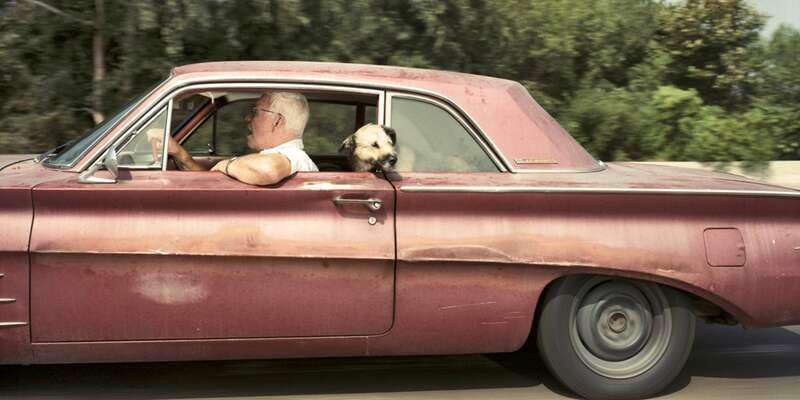 If we could actually pay attention to the other drivers, we might see these people on the road every day, any day? AB: Right. There are a lot of cars and we might imagine a sequence of photographs as representing a sequence of encounters within a traffic pattern for a particular day. But then we also get into the realm of probability, radius of travel, the differing appearances of neighborhoods and peoples’ habits of circulating throughout the day. Here, however, there are a blend of drivers representing long and short journeys on different days and times of day. But there is a uniformity and a fixed sequence presented by the bound book which might be interpreted as a set of cars that we might have seen on one day. JR: We looked at the photographs in a number of different sequences. What was your final concern in arranging the pictures as they are now? AB: In editing for a book a series of this sort you always have to think about what will make someone turn the page because, in many ways, these photographs are all the same. On a very basic level, it is curiosity; it is being open and susceptible; it is a type of hypnosis. Reading a book puts us in a kind of trance. Werner Herzog recognized this with movies also. In Heart of Glass the cast has been hypnotized to create a movie that as we watch we realize that we, too, are being hypnotized. Why? Because we don’t leave the theater. Looking at photographs in a book is different than reading or watching a film though they are all in a predetermined sequence. We absorb visual information much more quickly than words, and we are not seduced by the moving image, unless it is the turning of the page. Do people look at photography books as if they were reading words on a page. I don’t. I will start from the beginning and move to the end but I will also open the book at different places, skim over some pictures, stop at others. Today it is asking a lot of the viewer to be led through any predetermined consecutive sequence of things. The essential mode of our time is “random play” and creating your own play lists. The author, the director, has deferred to the reader. Perhaps these photographs should have been presented in a box—to be shuffled about and rearranged—but the more you look at elements the more you realize that some things will go together and others won’t. A fixed form, a bound book, accumulates meaning through both the author’s intentions and the reader’s imagination. There is still that struggle to communicate and understand one another when something is committed in a fixed pattern. Anyway, in many ways I felt a book is very suitable to this particular work because the experience of driving is one that lulls us into a trance of sorts. So I wanted to mimic that activity; I wanted to try create a kind of quiet for looking at others that would occasionally be disrupted by minor incidents in the photograph such as the driver looking back, or a man eating an apple. JR: I’m interested in the photograph of the man eating the apple for other reasons as well. I’m taken in by how the poles along the landscape vibrate, mackle, and create those mesmerizing fence-like shapes. And, of course, by the fascinating foreground/background dynamic. The effect is just so handsomely described in your picture. Before we close I’d like comment on another photograph, also. The second picture in the book is of a woman in a Jaguar “caught in traffic.” The car’s windows are completely closed and she seems hermetically sealed within the vehicle. She could almost be one of Madame Toussaud’s wax portraits. There is an elegance in the description that is characteristic of photography’s unique ability to precisely delineate the details of surfaces, of hair, skin, and scratches. But I also feel that if one of the windows was open just a little bit there would be a passage into her world, an opening through which I feel communication could take place. As it is all we can really do is inspect her from the outside, like a specimen on a microscope slide. AB: Now that you mention it, she does look like she’s in a vitrine. JR: But I do get a lot of pleasure when one of the drivers has rolled the window down a third of the way, or a quarter of the way, or one fifth of the way, and there’s this little passage that you can sort of enter into visually. Even that little element, that careful choice, reveals something about the person. AB: Yes, there is a photograph of a woman and her dog in the front seat. Her two rear windows are rolled down to exactly the same height and her two front windows are at the same height, too. It is mostly about temperature control but seeing it in a photograph…. JR: It’s like a Mondrian. The windows are wonderful elements in the pictures: both the transparency and the opacity of the windows. The smears, the rust, all these details add up as they do in a good novel, building meaning and character. I don’t think I made my point very well, but what I was trying to say was that no matter what camera you’re using you couldn’t have made these pictures except in this passageway on the road—while driving beside these other drivers and working in a space that is so common and yet so invisible. Your photographs work on many levels. They record where we have been, but they also warn us to carefully consider where we are going. By preserving these moments from our accelerated lives, you remind us that we essentially inhabit a world to which we pay but little attention. Posted in Interviews and tagged Andrew Bush, Archive Highlights, Automobile, Jeff Rosenheim, Los Angeles, Other, Surveillance, Vector Portraits, Yossi Milo Gallery.